BETSY WETSY was the star of the IDEAL TOY CORPORATION, New York, for many years, starting in the 1950's. The company name is usually found on the back of the head or on the back, often with a manufacturing lot number. Made in the USA, Betsy had a tiny open mouth in which the "mom" could insert the filled bottle with results on Betsy's other end! Originally her head was hard plastic and her body soft plastic/latex, with jointed shoulders and hips. The box of the 1950's said "Little Miss Betsy Wetsy." She was produced in the 1950's and 60's in 8 inch, 13 inch, and 22 inch sizes, with perhaps others. Some versions had molded hair, and others had plugged hair in blonde, brown, and even red. I think there was a Black Betsy Wetsy, but I haven't found any solid information there. Prices on the 1950's/60's dolls varies with condition, but MIB (mint in box) versions are commonly in the $50 range. Remember, there were many thousands of these made, and while some owners may ask $300, there are others out there at a more realistic price. Clothing and accessories varied all over the place, especially with companies like SIMPLICITY selling patterns for making more clothes. 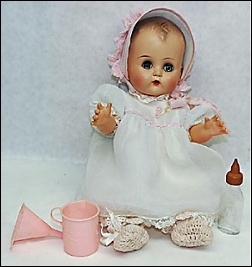 The most common outfit I've found for the original dolls was a striped sun-dress, but I'm sure there were others. In the late 1980's, a failing IDEAL company reissued the Betsy Wetsy with a made-in-China version, but it didn't catch on.